But instead of being distracted by the bright lights, Tomic knuckled down and Troicki was impressed by the 23-year-old’s dedication and work ethic, both of which have been criticised throughout his career. “Belgrade is really famous for night life and I thought Bernie was going to go out every night,” Troicki said. As recently as last week Australian coach Roger Rasheed lashed Tomic’s languid style on the court, suggesting he either started showing passion or give the game away entirely. Troicki said anyone with doubts about Tomic’s passion should’ve watched him this past week. “He was really pumped for this tournament,” said Troicki, who lost in four sets to defending champion Stan Wawrinka on Sudnay. “He worked really hard to bring his best game here, even though clay is definitely his weakest surface. “But he was focused for this tournament. Unlucky he lost to (Borna) Coric in a tight match. Tomic has freely admitted his troubles on clay, explaining that as he didn’t grow up using the surface he has never felt comfortable playing on it. 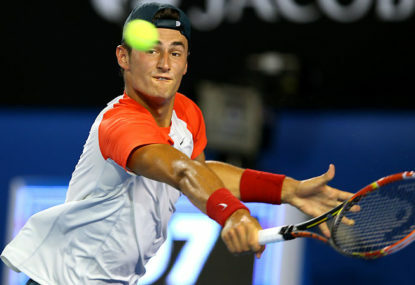 And Troicki believes after years of being “spoiled” by Tennis Australia, Tomic has turned the corner and is ready to deliver on his talents. “He likes to enjoy a little bit life, which is fine. He’s a really talented player,” Troicki said. “I think he can be a great player, but he’s now realising that time is ticking and that he needs to be more serious about stuff that he does. “I think he’s dangerous when he plays good. He’s really very talented.